I’m in love with ruffles….that’s not my dog (he’s Kobe), I’m talking about the frilly flouncey embellishments that transform the humble scarf into something amazing. Simone’s modeling Karen’s weekend creation, ruffle scarf – put simply, it’s gorgeous. Karen used possum yarn, the colour akin to mustard marl. She picked the yarn up at the city Hospital Shop for nicks, can’t remember exactly how much but cheap as chips for possum. 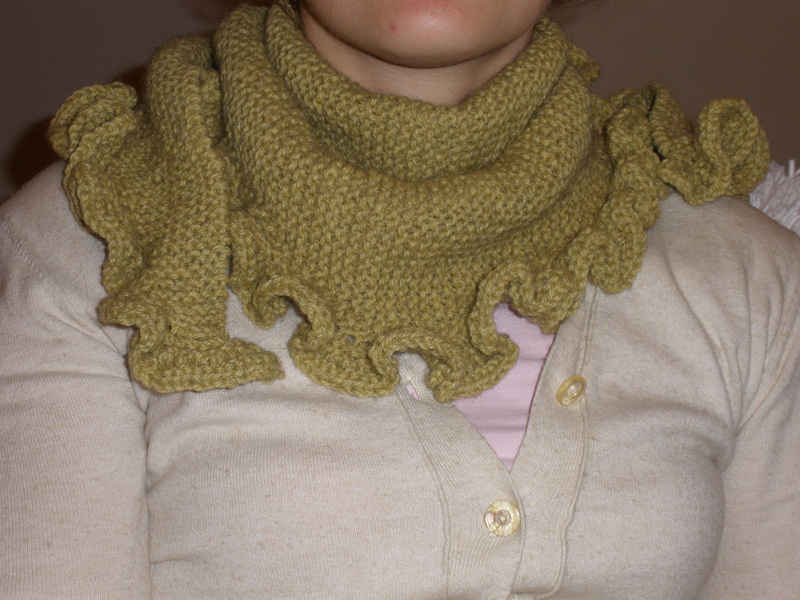 Karen said the frill was her idea and not part of the original pattern – we all agreed it made the scarf. A simple design, all garter stitch. Adding a ruffle does soak up the wool though. I don’t care, I love how they look and Karen’s project inspired me to search for a pattern. Adelphi Ave. Shawl from Berroco Sock Star Booklet #297 knit in Ultra® Alpaca Fine. I nearly went crazy trying to locate this pattern, I’d spied it somewhere over the past few months. I could visualise the pretty girl draped with the striking shawl, I could even remember the colour combo. But do you think I could remember where on the net I’d seen it – I was so sure it was while browsing Berroco but repeated searches yielded nothing…..or was it Ravelry, or Knitty, or…. Then I twigged it may have been in a pattern book so started methodically clicking on all the pics in Berroco’s books…. and there she was! This lush, two-colour shawl comes in two sizes; both wrap generously around the body. 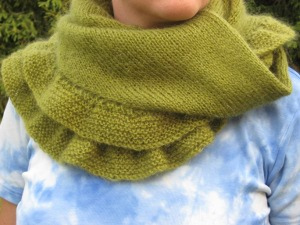 The shaped triangle is knit with two layers of flounces. 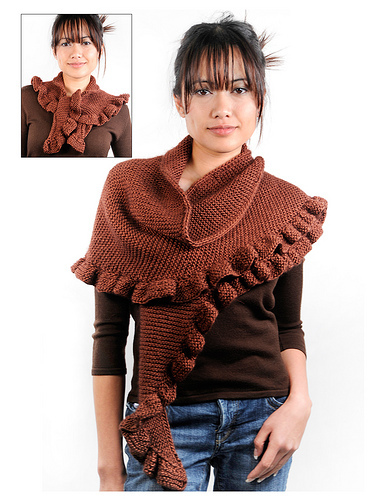 I love the idea of this shawl, it may be a little too big for me though – I’m still thinking about it. Berroco books aren’t available in NZ either so that’s another thing to consider. Like Karen’s scarf, it’s knit in garter stitch. Diamond luxury Collection Mulberry & Merino 1402 Ruffled Scarf and Wrap by Michelle Porter (Ravelry). Garter stitch again. 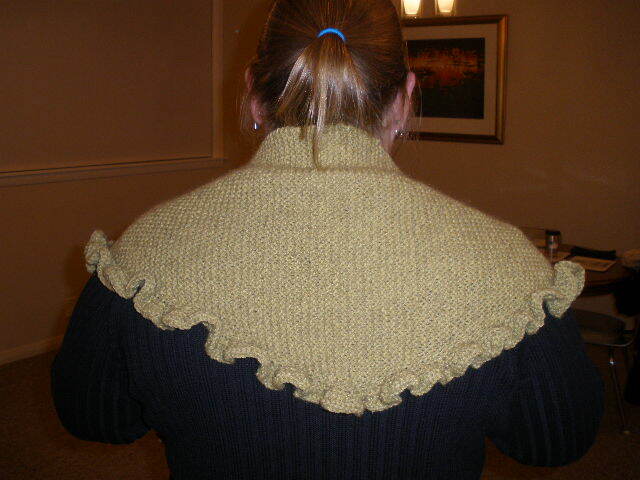 A Little Ruffle by Jennifer Lang – pattern available free on Jennifer’s link and as a free download on Ravelry. 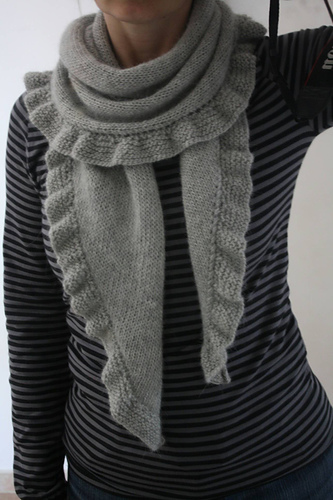 This is likely the scarf I’d make, this time the body of the scarf is stocking stitch and frill garter stitch…nice. Yarn suggested Garnstudio DROPS Alpaca (4 ply), I’ve used it before and it’s a lovely yarn to work with and wear. Green’s cool. 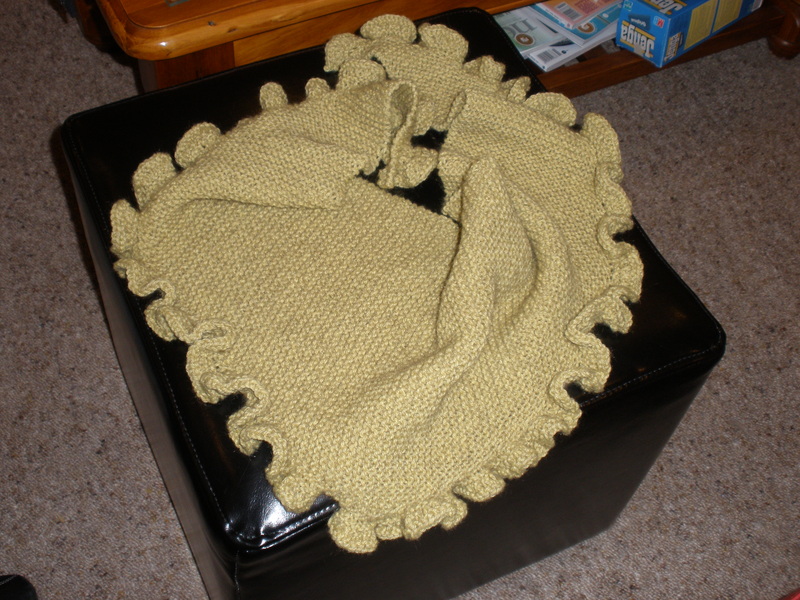 Simone’s latest WIP for a friend’s baby due in August – pattern another free Ravelry download. The pattern is a 1950 vintage, knit from the neck down. It’s shaping up to be very nice. 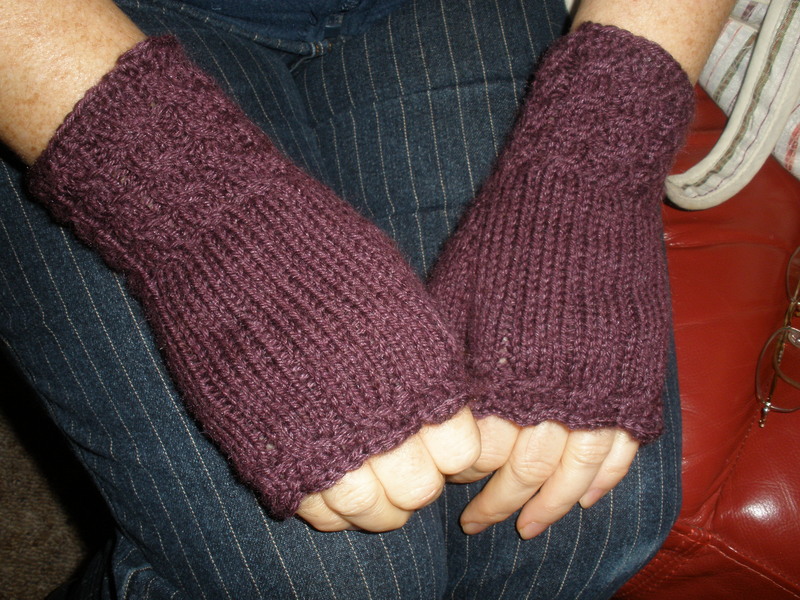 Lyndsay’s gauntlets, for herself – yay! The camera was good to me this week. 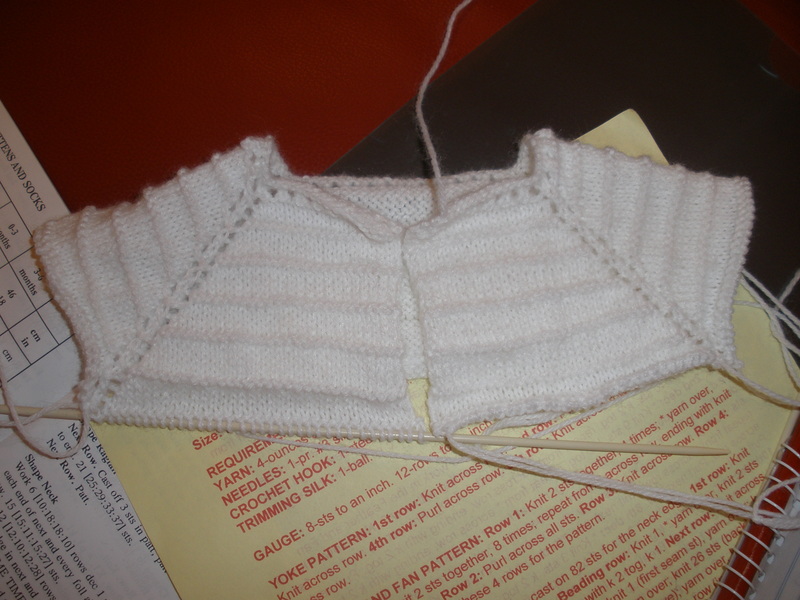 I’m onto the sleeves of my little cardy and hope to have it finished this week. 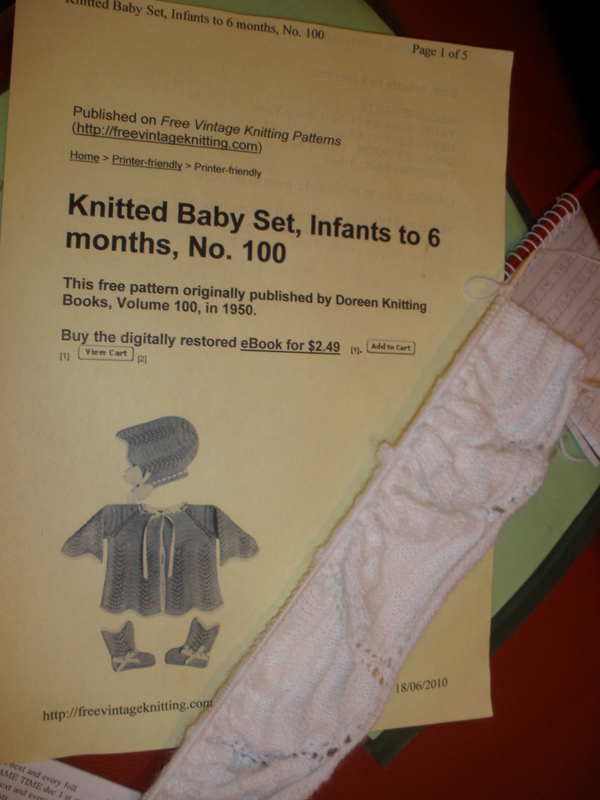 That’s what so cool about knitting baby’s garments – they’re super quick. Hey, hope you notice my new blog theme. I’ve been playing round with ideas for a while and this is what I came up with, thanks wordpress. …an open informal friendly group getting together to knit with like minded people who enjoy knitting – we share ideas, knitting know-how, show off finished projects, as well as enjoy good company and a cuppa – in short, we share our love and passion of knitting.